Artlyst travelled to sunny Margate and Turner Contemporary’s Sunley Gallery to view two major works by leading contemporary artist Yinka Shonibare MBE. The new pieces have been created as part of the 14-18 NOW programme of World War 1 Centenary Art commissions, and coincides with the gallery’s fifth anniversary. Image: Yinka Shonibare, The British Library, 2016, Turner Contemporary, Margate, Photo: P A Black © 2016. The viewer is met with the sight of the artist’s first work on display; ‘The British Library’ upon entering the gallery. Consisting of shelves of books, with sleeves made out of Shonibare’s trademark colourful wax fabrics, their spines bearing the names of immigrants who have in fact enriched British culture. These include the likes of T.S. Eliot, Hans Holbein, and Zaha Hadid. The installation is a reflection on social displacement, a rebuke to those who fear immigration, and social change, The amalgamation of cultures, fusions of creativity and intellect leading to the enrichment of our very lives, surely something to be embraced. 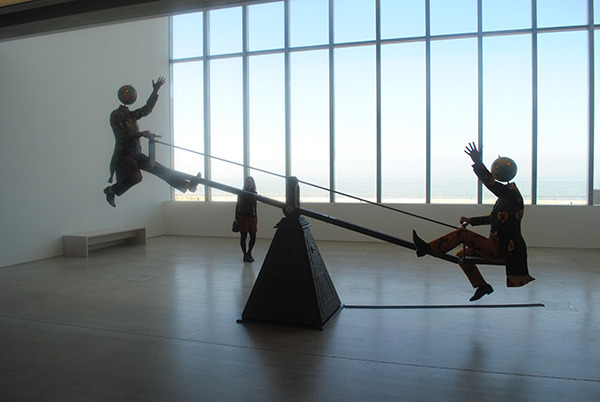 These latest works have been co-commissioned by Turner Contemporary and 14-18 NOW, with the artist’s trademark colours also unveiled in the form of two figures dressed in the artist’s bright and patterned fabrics – remaining at the heart of Shonibare’s practice – each figure balanced in opposite positions on a Victorian steam-punk seesaw – a signifier of an empire-building industrial revolution perhaps – Atop the shoulders of both figures rests their globe-heads, highlighting the countries involved in the First World War. The work is at once seemingly frivolous and yet disturbing. Image: Yinka Shonibare, End Of Empire, 2016, Turner Contemporary, Margate, Photo: P A Black © 2016. In fact the balance and imbalance of human relationships are at stake in this work by Shonibare, ‘End of Empire’ explores conflict, dominion and the highly contentious issue of migration – which rest on the shoulders of the artist’s figures, as they slowly rise and fall – both literally and metaphorically – their kinetic dance symbolising conflict and resolution, in a state of unending flux, the relationship remains perpetually unresolved. The work takes on a further poignancy shown against Turner Contemporary’s dramatic view of the North Sea: a conveyor of commerce and migration. The globes highlight political alliances forged from the flames of a world war that changed our geopolitical map forever and with it British society. One enduring element of the artist’s work which serves as a signifier of societies cultural misconceptions, is Shonibare’s continued use of ‘African’ fabrics, a key material in the artist’s work since 1994, which is in fact Dutch wax-printed cotton. This material usage becomes another conceptual proponent of both works – a signifier of cultural diversity effecting positive change, creativity, and therefore social evolution. Shonibare’s installation truly reflects the current zeitgeist. 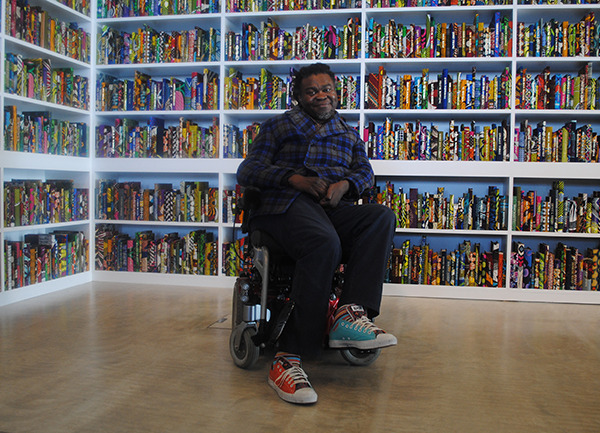 Yinka Shonibare MBE RA was born in London and moved to Lagos, Nigeria at the age of three. The artist returned to London to study Fine Art first at Byam Shaw College of Art (now Central Saint Martins College of Art and Design) and then at Goldsmiths College, where Shonibare received his MFA, graduating as part of the ‘Young British Artists’ generation. The artist currently lives and works in the East End of London. Lead image: Yinka Shonibare, End Of Empire, 2016, Turner Contemporary, Margate, Photo: P A Black © 2016. Yinka Shonibare: End Of Empire – Turner Contemporary, Margate – until 30 Oct 2016.